Every business, organization, church, or group you encounter has a culture. 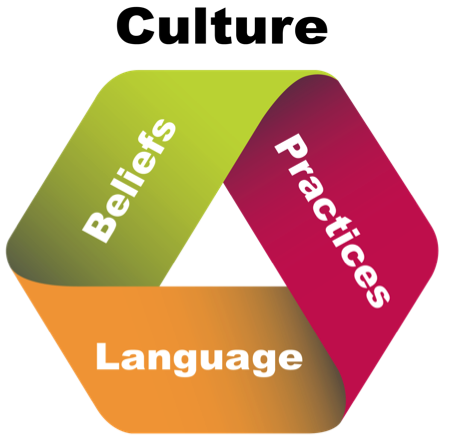 Culture can be defined by the distinct combination of beliefs, practices, and language of a defined group. The three of these, meshed together create the culture of the group. As you begin gathering people into your new faith community it is absolutely essential you are intentional about creating the kind of culture that you wish to endure. If you are not creating culture intentionally, one will arise that may actually be contrary to the calling God has placed upon your heart. More than one church plant or new faith community in recent years has been hijacked by the dysfunctional culture brought to the community by those who joined it. Do not let the culture you create undermine the mission you are on. A culture has three essential parts: beliefs, language, and practices. These combine to create the lived culture of your organization. fabric of the church. Being mindful of this will allow you to be intentional about your beliefs and how you share them. Language: beliefs are reinforced by language. What you say actually matters, probably far more than you realize. Will the language you use for humanity be inclusive? For God? What beliefs does that kind of language reinforce in the lives of those in the community? What do you call those people who have not yet had a positive faith experience? Does your language indicate openness to those who doubt or is it exclusionary? As you create your culture you may find it helpful to develop a vocabulary list of words and phrases you want to intentionally incorporate into your new faith community and make them part of your regular communications strategy. Practices: What did your mom say? Actions speak louder than words? When creating culture they certainly speak just as loud as your words. Do you want participants in your new faith community to invite others into their homes? Are you inviting them into your home? Do you want them to give radically? Do you give radically? In creating a culture you can pretty much be assured that the average participant will not exceed the commitment or life practices of the key leaders. What you model shapes the community. Additionally, what will be the “tools of the trade” for your new faith community? Will you be table-centered? If so then the table you choose makes a difference. If you will commune often, the Eucharistic utensils matter. If you are “green” then you probably shouldn’t plan on using Styrofoam coffee cups. Culture, according to Andy Crouch, is “what we make of the world.” It is the items we use and then how those items mold behavior and shape practices. Culture is either created intentionally, or accidentally. More on creating culture next week.